The chest is one body area where men and women aren’t exactly looking for the same results—so we spoke to Gold’s Gym Fitness Institute trainers Adam Friedman and Nikki Kimbrough to get the lowdown on the most efficient moves for both genders. These superfast workouts will help you rock a tank top in no time. 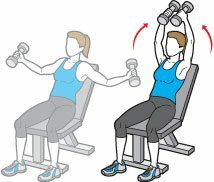 Why: Most women default to machines for chest moves like the fly. “Using free weights is much more effective because you really have to control your body weight, which requires additional energy so you see results faster,” Kimbrough explains. If free weights intimidate you, Kimbrough suggests reaching out to a trainer or knowledgeable friend to act as a spotter. Why: Unlike free weights, cables provide a continuous and steady level of resistance, which engages the small stabilizing muscles in your chest as well as the pectorals.How: Stand with one foot forward and your feet about hip width apart. Bend your chest slightly forward. Grip a cable handle in each hand. Your hands should be slightly above the shoulders and elbows slightly bent. 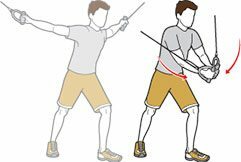 With your arms almost fully extended, slowly bring your hands together in a wide arc motion. Slowly return to the starting position and repeat. Why: “I see a lot of guys defaulting to straight bars whenever they do chest exercises because it’s easier to use momentum when you’re using both hands,” Friedman says. 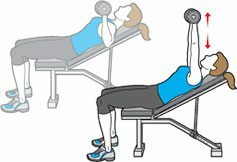 “Dumbbells are better because they require stability and balance.” This version of the classic dumbbell chest press also builds up stamina since you keep your arms and chest engaged at all times. Why: Both experts concur that this is an often overlooked but vital move for getting a great chest workout. “Many people just stand, sit or lie on flat benches, but adding angles can challenge more muscle groups,” explains Friedman. The incline bench press helps you work the top section of the pectoral to help you get a toned look in tank tops and low-cut or sleeveless shirts. Why: The granddaddy of chest exercises still makes the cut as an essential part of any chest workout. Pushups work all your major upper-body muscles, plus they strengthen the neck androtator cuff muscles that stabilize your shoulders and help prevent injuries when you’re lifting and pulling objects—staple movements of most chest exercises. How: Lie facedown with your hands slightly more than shoulder width apart and your feet together. Keeping your body straight, push up.